A special contest celebrating the life and works of Ray Harryhausen, who turns 90 on June 29th, 2010, has been announced by Stop Motion Magic. 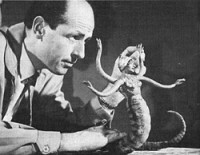 Ray Harryhausen is regarded by many as one of the greatest stop motion animators and special effects wizards of all time. During his long career Ray Harryhausen has taken movie goers on adventures through mythical lands with heroes like Jason and Sinbad, and has shown the monsters that lurk beneath the sea. In celebration of those films and fantasies, Stop Motion Magic has announced the Tribute to Harryhausen Stop Motion Film Festival with a call for animators to take part take part by creating their own stop motion tribute. Animators can use their favourite Harryhausen characters in a new way, or create a new myth in his style. Puppet animation is preferred, as Harryhausen created incredibly lifelike creatures, but quality claymation, toymation, cutout animation, and other animation techniques are welcome. Entries should be submitted by June 1st, 2010. For more details visit the Stop Motion Magic website.